Even SHIELD spymaster Nick Fury would be impressed at the secrecy surrounding Avengers: Endgame. Still, mere hours away from its release, its plot and mysteries have been kept mostly under wraps – we don’t know who’s alive or dead, what it’s plot will be… We don’t even really know who’s in it. But fans were never going to let that shortage of concrete information get in the way of coming up with their own Avengers: Endgame theories, were they? They’ve looked for clues in Marvel Comics, the events of Avengers: Infinity War, the other 20 previous MCU movies, and what’s been said by the cast and crew about the Avengers: Endgame ending to formulate their own ideas of what’s going to happen. When Doctor Strange is saying there are 14,000,605 possible ways the denouement could play out, one of the Avengers: Endgame theories has got to be one the money. Right? So if you’re wondering what the Soul Stone theory is, or want to get a handle on how time travel will (probably) impact the story, read on... You’ll find out the answers to these questions and more. And if you have Avengers: Endgame theories of your own – who knows, maybe the whole MCU is Captain America’s dream and he’ll wake up in World War 2? – let us know in the comments section below. The theory: That everyone who ‘died’ in Thanos’ snap, didn’t actually die, but was transported to another dimension via the Soul Stone. The evidence: This theory comes from the comics, which sees just this happen and the inhabitants live out comparable but idealistic lives as prisoners of the Soul Stone (which is sentient). While the MCU certainly doesn’t always follow the same events as the comics, there’s more evidence to support the Soul Stone theory. Remember the moment after Thanos snaps his fingers in Infinity War and is temporarily transported to a dreamlike world where he talks to a young Gamora? Some fans think that this is the Soul Stone world because of the orange hue (the same colour as the Soul Stone) surrounding him, and the fact that Gamora is there, albeit as a child, means she’s still alive. Amazingly, one of the Avengers 4 directors has actually already confirmed this theory shortly after the release of Infinity War saying this at a Q&A at Iowa City High School (via TheRealStanLee.com): “Yeah it’s implied [that] it’s the Soul Stone. It’s all orange around, then he’s inside the Soul Stone with the amount of power that it took to snap his fingers – he has this out of body experience with Thanos.” He went on to confirm that Gamora is still alive: “She, in fact, is [alive], yes.” While he doesn’t mention anything about all the other victims of Thanos’ snap being in the Soul Stone world and there’s a possibility that Gamora’s death was special because it helped him get the Soul Stone, it stands to reason that this would be the case. Plus, we know that Marvel Studios has future plans (and sequels) for some of the characters who died in the snap, so they’re going to have to come back one way or another and the Soul Stone theory seems as good a theory as any other. What it means: That everyone who died in the Snap could come come back. In the comics the prisoners of the Soul Stone are brought back using the Infinity Stones and given new bodies and are able to live out the rest of their lives in the ‘real world’. Or that an alternate Marvel universe could be created, which removes certain characters from the currently stuffed MCU without actually killing them. That would be handy. The theory: That Ant-Man (and possibly others) will travel back in time to… do something that will save the world. The evidence: This Avengers 4 theory is still a bit vague. We don’t really know why time travel will be used in Avengers 4 yet (but safe bet it has something to do with saving the world), but we can say with some confidence that time travel will definitely be a part of the movie. And that’s because of these Avengers 4 set photos. If you take a quick look, you’ll see that Captain America looks very different to how he did in Infinity War… in fact, he looks like he did in the first Avengers movie! It’s the same costume (the one he doesn’t wear anymore), the same hair, the same joyful expression - almost as if half the world isn’t dead! Add to that the background and you’ve got a fairly compelling argument for this scene being from the Battle of New York in The Avengers. But wait… isn’t that Ant-Man? This is why the set photos hint at a time travel theory rather than merely a flashback or dreamlike coma - because Ant-Man was never in The Avengers, so why would Paul Rudd be in full costume on set for a scene that looks like a reshoot of the Battle of New York? Because time travel. Plus, check out Iron Man next to him… sure Iron Man was in The Avengers, but he looks a bit different to how he did in that film, doesn’t he? In fact, he looks like he’s wearing the more casual and flexible version of his suit, which we saw in Infinity War. Could Iron Man have travelled back in time with Ant-Man as well? That’s not all either. Thor has been seen on set sporting his original Avengers look with Loki wearing a muzzle and supposedly holding the Tesseract (although one of the Russos has hinted that this might have something to do with Tony’s BARF technology featured in Captain America: Civil War). Zoe Saldana revealed a behind-the-scenes look, which shows Gamora wearing her original Guardians of the Galaxy costume and Evangeline Lilly did the same, but showed off Hope’s old hairdo, which we know she doesn’t have anymore thanks to Ant-Man and the Wasp. While these scenes and outfits could all be part of flashbacks filmed for Avengers 4, it’s Ant-Man’s appearance in the images above which seem to confirm the time travel theory. In term of how he’ll time travel, there are two possibilities. 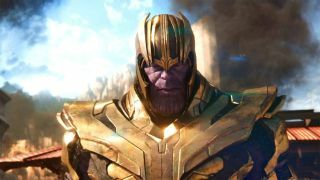 The Time Stone would seem like the most logical option, but that’s currently in Thanos’ possession. However, the Time Stone is technically untethered in time, which means it can pretty much turn up anywhere in the past or future where Ant-Man, Iron Man, or anyone else could get their hands on it. The bigger problem is that the only person who can wield the Time Stone - Doctor Strange - is dead/possibly trapped in the Soul Stone world. The more likely possibility is that Ant-Man travels to the past through a time vortex in the Quantum Realm. Don’t know what that is? Yeah, us neither really, but it was mentioned in the Ant-Man and the Wasp post-credits scene, which as we know has major links to Infinity War and Avengers 4. As Ant-Man is about to enter the Quantum Realm, Janet van Dyne says: "Don't get sucked into a time vortex, we won't be able to save you.” It seems like a throwaway remark, but Marvel doesn’t do anything without good reason, so there’s a good chance that this will be how Ant-Man finds himself in the middle of the Battle of New York. What he does from there… well, that’s another question. What it means: The possibilities are endless and it really depends on what kind of approach Marvel takes to time travel. We’ve never seen time travel on this scale before in the MCU, so it could go one of two ways. Either Ant-Man will accidentally drastically change the past and return to a future he doesn’t even recognise, or he could do something/find something/bring something back which helps our heroes defeat Thanos for good. The later is more likely based on the comics and what we know about the MCU, but your guess is as good as mine right now. The theory: That Avengers 4 will start about 5 years after the events of the Avengers: Infinity War ending. The evidence: Firstly, a curious casting call for a teenage Cassie Lang (that’s Ant-Man’s daughter if the name doesn’t ring a bell) hinted at some sort of time jump/alternate timeline as the character is still fairly young in Ant-Man and the Wasp, which is set at the same time as Infinity War. Then Gwyneth Paltrow dropped the epic spoiler than she and Tony will be married and have a child in Avengers 4, which had all us wondering what was going on. While both these tidbits could hint at many different things, including a time jump, alternate universe, or even some elaborate hoax, it’s this tweet from Daniel RPK (a well-known source in the superhero movie world, who’s been right before), which indicates that this is all evidence that Avengers 4 will start with a 5 years time jump. What it means: It’s pretty exciting given that most MCU sequels don’t have that big of a gap between them, but especially considering the events of Infinity War. What will the world look like after five years with half the population gone? Will Thanos be proved right with the Earth becoming a luscious paradise no longer ravaged by global warming or overpopulation? The time jump theory could also present the remaining Avengers with an ethical dilemma when it comes to reversing the snap. If they use time travel to do it (as the theory above suggests) that means everything that happened in the five year time jump will be undone… including any births, such as the arrival of Iron Man Jr. (Does that count as murder?) And is Tony likely to help change the past when he knows that it could eradicate his present life with his wife and child? So. Many. Questions. The theory: That some of the Avengers are not really the Avengers at all, but actually Skrulls in disguise. The evidence: This Avengers 4 theory originally surfaced post-Snap as fans were desperately trying to explain away all of Infinity War’s heartbreaking deaths. Wouldn't it be nice if everyone who died in the Snap was actually a Skrull in disguise and the real Avengers were found locked away somewhere alive and well? While the theory that all those who died in Infinity War weren’t actually who we thought they were doesn’t make as much sense anymore - it would be a pretty big coincidence for only the fake Avengers to die! - it did lead to a more convincing theory that the Skrulls will be a part of Avengers 4 in some other way. In case you don’t know, the Skrulls are classic Marvel comic book villains, which are being retroactively introduced into the MCU via the Captain Marvel movie, which is set in the ‘90s. An alien race of shapeshifters, they are most well-known for the comic Secret Invasion, which sees them kidnap and impersonate some of Earth’s Mightiest Heroes. This theory is supported by a recent Avengers 4 behind-the-scene photo courtesy of Benedict Wong’s Instagram. Either Doctor Strange’s companion having one hell of a facial or his skin is being pulled off to reveal he’s really a Skrull underneath! This, paired with the fact that we know the Skrulls come to Earth in the ‘90s, has led some fans to believe that we’ll find out in Avengers 4 that some of our heroes aren’t our heroes at all but Skrulls. Which begs the questions, where are the people they’re impersonating? Dead, imprisoned, or something else? A similar but slightly different theory suggests that the Skrulls will take advantage of the Snap and use it to take over the lives of some of the powerful people who died in Infinity War. Think about it, not only did some pretty influential superheroes bite the dust, but some regular powerful world leaders might have also died, leaving space for an alien who looks exactly like them to take their place. What it means: TRUST NO ONE. Seriously, anyone in the MCU post-’90s could be a Skrull. Iron Man, Black Widow, Hawkeye, you, me… and sure, Cap says he was frozen in ice for over 50 years, but he could have actually died at the end of Captain America: The First Avenger and been replaced by a Skrull. That said, the fact that the Skrulls’ backstory was significantly changed in the Captain Marvel movie – making them rather less villainous – may blow this theory out of the water. The theory: The Quantum Realm will turn one of our heroes into Captain Universe and help defeat Thanos. The evidence: This is a theory put forward by our very own Sam Prell who explains how the Quantum Realm might save everyone in Avengers 4 more fully in the feature I’ve just linked to, but here are the basics... In the Marvel comics, there’s something called the Enigma Force, which is a sentient energy that permeates a parallel dimension called The Microverse. The Enigma Force sometimes imbues heroes with the Uni-Power (the manifestation of every person in the universe's heroic potential) in times of great peril, turning them into Captain Universe - a very powerful superhero who is able to defeat whatever is threatening the universe that week. Based on what we know about the Quantum Realm in the MCU, it’s very similar to the Enigma Force and could even be the MCU’s version of the Enigma Force (much like how the Infinity Stones are the MCU’s version of the Infinity Gems from the comics). If it is, Avengers 4 might see one of its heroes transformed into Captain Universe to help defeat Thanos once and for all. Who could it be? Well, Ant-Man is currently stuck in the Quantum Realm so he’s the most obvious choice and could actually find a way out of the sticky situation he’s in with the help of the Quantum Realm/Enigma Force. Once free, perhaps the Uni-Power will move onto a new hero to lead the battle against Thanos as Captain Universe before returning to the Quantum Realm once the battle is won. What it means: That the Avengers actually have a chance at defeating Thanos this time around. Honestly, even without the Infinity Gauntlet, which was destroyed in Infinity War, Thanos is still a pretty menacing foe and the Avengers are severely understaffed since the Snap. Captain Universe might be the answer to the question, how do the Avengers win? The theory: That Hawkeye will appear in Avengers 4 under the new identity of Ronin. The evidence: When everyone realised that Clint Barton/Hawkeye wouldn’t be in Infinity War, there wasn’t exactly major outrage… but questions were definitely asked about where he was. “We like Hawkeye,” writer Christopher Markus told Buzzfeed. “We like Hawkeye so much we gave him a really good story,” implying that he most certainly would turn up in Avengers 4. Based on some Avengers 4 set photos, which show a change in costume, this theory suggests that Hawkeye won’t appear as we’ve seen him before, but under the new identity of Ronin. The name Ronin refers to the Japanese term for a masterless samurai, a lone warrior, and it’s an identity which is adopted by many different Marvel characters in the comics, including Hawkeye. In the comics, Clint Barton is the second person to adopt the Ronin identity after rejoining the New Avengers post-Civil War, and although it’s merely just another, secret identity and doesn’t give him any ‘powers’, as Ronin, Hawkeye uses many different weapons other than just his bow. The most logical explanation for him adopting the Ronin persona in Avengers 4 is that after being sent to prison for his role in Civil War and then making a deal with the authorities for his release (much like Ant-Man), he won’t want to get caught taking part in any more illegal vigilante superhero activities. As Ronin, he can help the Avengers without having to worry about breaking the Accords and going back to the big house. What it means: That Hawkeye will have a different costume in Avengers 4? And maybe some new weapons? And we might have to call him Ronin instead? Not much basically. Thirsty for more MCU tidbits? Read our spoiler-free Avengers: Endgame review.